With the festive season well and truly under way and the weather, as expected at this time of year, warming up to produce temperatures in the high 30s, the prospect of a SOTA expedition to the high country proved too hard to resist. Noting that the forecast for Falls Creek and Mt Hotham predicted maximum temperatures of 12 degrees, my lady and I decided that the time was right for an expedition “up the hill”. We had on previous trips up to the high country done a recce of Mt McKay and we knew that despite its height (1,849 metres) it was relatively easy to access. The 4WD was temporarily out of action and so this expedition would have to be to a Summit that could be reached using only a 2WD vehicle, plus Shanks Pony for the final ascent. Mt McKay fits the bill very well, having a good road all the way to the top. It’s a different story in the winter when the whole mountain is covered in a deep layer of snow, but in December that wasn’t going to be a issue. From Albury it’s about a 2 hour drive through Mount Beauty and up the Bogong High Plains Road to the Falls Creek resort. As we climbed up past the Bogong Village we noted the air temperature falling until, as we reached Falls Creek, it settled at a comfortable 18 degrees. A bit warmer than the predicted 12 so perhaps the woollies and other cold weather gear we’d brought wouldn’t be needed. Bogong High Plains Road is steep in places and has a few sharp twists and turns along the way, but the scariest hazard we encountered on the way up was the large number of cyclists powering their way up, puffing and panting with teeth gritted, sweat pouring off them, and absolutely no awareness of other traffic on the road. Most of them looked as though they were enduring fearful torture, with faces contorted in grimaces of pain. And they do this for fun? I thought some SOTA folks were a bit odd, but this was beyond me! There are a number of dirt roads running from Falls Creek towards Mt McKay but fortunately they are well signposted, so finding the right one wasn’t too much of a challenge for our navigational skills. Once the Summit is in sight it’s obvious, with a large shed and a communications tower right on the top. There is also a refuge hut up there for emergency use by winter travellers, though it could probably be pressed into service as a shack for SOTA operations for those not wanting to set up out in the weather. As there are no trees or other available support structures on the Summit, I gave my 4.5m pole its first outing. This is actually made up from five or six socketed fibreglass tent poles with elastic shock cord running through the hollow centre, holding the whole thing together. It stands on a plastic base to prevent it sinking slowly into the ground and has three guy lines to hold it sort of vertical. I hadn’t deployed it on a Summit before and was pleased to find that it all went together quite easily so that we had the pole up and the antenna in place within about ten minutes. 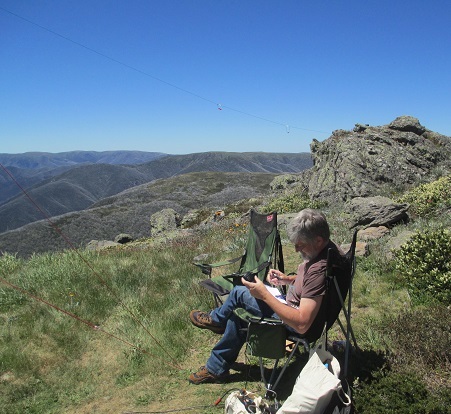 I had been watching the SOTAwatch alerts and knew that Wayne, VK3WAM, was intending to be out and about on Mt Margaret, VK3/VT-031, using CW, so the first place I listened was on Wayne’s frequency. A few seconds after I switched on the FT817, there was Wayne calling CQ. Frantically I fiddled and faddled, finding the keyer and plugging it in to the back of the FT817. Wayne came straight back to my first call and we completed the Summit to Summit QSO with 579 reports both ways. Signing off with Wayne I looked up to discover that I had an audience. A party of bushwalkers had stopped by and wanted to know all about what we were doing. By a strange coincidence my lady found that she knew one of the bushwalkers from a previous life. One of the party, seeing the pole, asked if we were fishing – an odd question since the nearest body of water was a couple of kilometres away and several hundred metres lower down! But I suppose in a way that is exactly what I was doing. Chasing SOTA summits is a lot like fishing in many ways! Fortunately my lady gave the visitors a run down on what SOTA is all about and then explained what I was doing as I put the keyer away, got out the microphone and made a quick SSB QSO with Phil, who was using the special event call VI100ACT. Continuing the chain of coincidences for the day, it turned out that Phil was operating from Talmalmo, from a venue that is directly across the road from a block of land that my lady and I own. After a break and a bite to eat, I put up a spot on SOTAwatch and proceeded to call CQ on 7MHz SSB for a while. Strangely, I got no response. I checked all the connections, measured the battery voltage, checked the SWR and all appeared in order. What the..? Then the penny dropped. My spot said I’d be on 7.090 but the FT817 dial was on 7.060. Fault found: the classic “short between the earphones”! I found 7.090 occupied by Joe VK3YSP and YL Julie VK3FOWL who were activating the Wyperfeld National Park for the Keith Roget award. They had a small pile-up going, so I waited until I could give them a call. We made a quick QSO and then they very kindly left the frequency to me. In short order I worked VK3JY/p, VK3ZPF/p (S2S), VK2DAG, VK2YW, VK3BQ/2, VK3BHR, VK3FPSR, VK3HRA, VK5PAS, VK3DET and VK3OHM. I heard VK3MRG calling me but unfortunately we couldn’t complete a QSO. After that it all went quiet apart from the buzzing of the march flies who, having discovered our location, were now pouncing on us in droves. I am still working on the technique of operating the radio and keeping the log one-handed, whilst keeping the other hand free for swatting flies. Having enough QSOs in the log to qualify the activation, my lady and I decided we’d leave the Summit to the flies. We had the antenna down and everything packed in record time, and then we beat a hasty retreat down to the relatively insect-free Falls Creek resort where an ice cream awaited. Having a knowledgeable person on hand to answer questions can be very helpful when inquisitive visitors turn up on a Summit. Don’t be deceived by the air temperature. It may only be 18 degrees but at altitude the UV is extreme, so it’s even more important to cover up, wear a hat and use sun block. It’s a small world. You never know who you’re going to bump into, on the air or on a Summit in the middle of nowhere. Don’t forget the DEET. When march flies are around, you are on the menu!